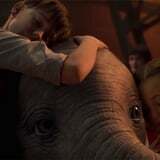 The Dumbo Trailer Will Make You Tear Up - But What Else Would You Expect? Disney is in the midst of remaking a ton of our favorite classics and among them is Dumbo, the tale of a baby elephant with ears so big he can fly. While many are unsure whether the classics need to be remade, there's no denying the new trailer for Dumbo looks as cute as it does entertaining. Think The Greatest Showman with less singing and more adorable elephant antics. The remake is directed by Tim Burton, so promises to be weird and wonderful. The cast includes Colin Farrell, Danny DeVito, Michael Keaton, and Eva Green. This is guaranteed to be entertaining and heartwarming for both those enjoying the story for the first time, and those reliving a familiar tale from childhood. Check out the official trailer now, ahead of the movie's release on March 29.